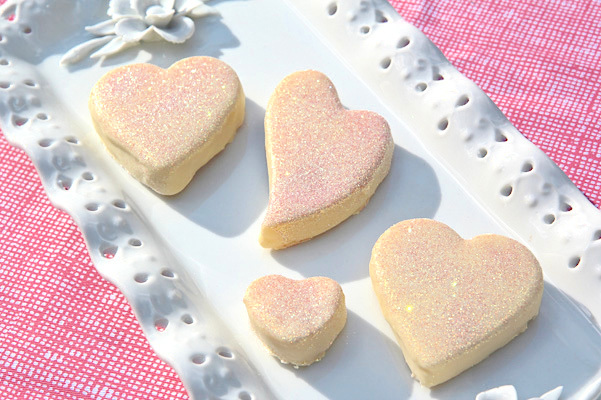 These are cake “balls” in a heart shape – a perfect treat for Valentine’s Day or even weddings. After you prepare the cake ball mixture, you press it into a pan and cut out the hearts with a cookie cutter, so really you could use any shaped cookie cutter you like (stars, dinosaurs, leaves, etc.) FYI, the flavor here is more white chocolate than lemon. Make sure to use a high-quality white chocolate that contains cocoa butter. I like Valrhona Ivoire, not only for its flavor, but also for its fluid texture once melted. Disco dust, sprinkled on top of our heart-shaped cake balls, is a very sparkly edible dusting powder that can change depending on your viewing angle. Position rack to center of oven. Preheat oven to 350°F. Coat a 13-inch by 9-inch pan with nonstick spray. Prepare the batter for the Easy White Cake; fold in lemon zest right before pouring into prepared pan. Bake and cool as described. While cooling, line an 8-inch square pan with plastic wrap so that it overhangs all sides. (I do this with two large pieces of wrap.) Set aside. Once the cake has cooled, cut it in half crosswise, wrap one half well in plastic wrap and freeze for future cake ball use. Crumble other half into a large bowl; use hands and pastry blender to create even, fine crumbs. Add ¼ cup lemon curd, and start mixing it in with a rubber spatula. The mixture will begin to moisten; keep going. Add a couple of tablespoons of lemon curd at a time, until the mixture begins to form a ball and comes away from the sides of the pan. Press the mixture firmly into the plastic wrap lined pan. It is important to press it in firmly and evenly because the bottom will eventually be the top of your hearts and you want as smooth and even a surface as possible. Use your fingers and/or a small offset spatula to make sure the mixture is even on top as well. (If you have another 8-inch pan and it nests within this one, you can use it to press the top down evenly with a piece of plastic laid on top of the cake ball mixture). Cover the top of the pan with plastic wrap and refrigerate until firm, at least one hour or overnight, no longer. Unmold the cake from the pan by lifting the plastic wrap up and out. Remove plastic and place cake square on cutting board, top-side down. Use your cutter to cut out as many hearts as possible. You will most likely have to pick each heart up as you go and pop it out of the cutter. Be careful to retain the heart’s shape. Melt chocolate in top of double boiler or in microwave. Stir until smooth. It is best to have the chocolate in a deep, narrow container so that it is easy to submerge the hearts. (This all depends on the size of your hearts, of course. I use a 2–cup liquid measuring cup). Line a half-sheet pan with aluminum foil and have two forks handy. Place a heart on a fork (do not pierce with fork) and lower into melted chocolate until it is completely submerged. Use both forks, if necessary, to withdraw heart from chocolate, then perched on one fork, tap the fork repeatedly against the side of the container to encourage excess chocolate to drip back into container. Take your time here; you want as much chocolate to fall away as possible while still keeping entire heart coated. Place heart on aluminum-lined pan. Repeat with remaining hearts, spacing them on pan so that they do not touch. Refrigerate briefly until chocolate firms to the touch, about 30 minutes. If you have excess chocolate that has pooled around the base of the hearts, you can trim it away with a sharp paring knife. Sprinkle Disco Dust on top of hearts, or apply with a small artists brush. Hearts are ready to serve (they are best at a cool room temperature) or they may be stored in an airtight container in a single layer for 3 days.